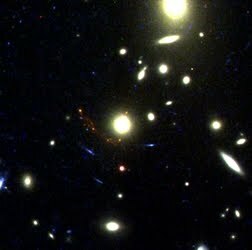 The findings show that "stellar nurseries" within the first galaxies gave birth to stars at a much more rapid rate than previously expected, the researchers from Durham's Institute for Computational Cosmology revealed. The Durham researchers based their findings on observations from the Gemini North telescope, based in Hawaii, and NASA's Hubble and Spitzer Space Telescopes. The research appears in the Monthly Notices of the Royal Astronomical Society. The research was funded by the Royal Astronomical Society. Lead author Dr Mark Swinbank, in the Institute for Computational Cosmology, at Durham University, said: "The runaway effect in this galaxy suggests it is growing much faster than expected. "Given the size of the star forming regions, we would expect it to be forming stars at the rate of about one sun per year, but it seems to be much more active than that. "We think this galaxy is fairly typical of galaxies at this time and we expect that the Milky Way once looked like this as it formed its first stars. "In effect we are seeing the first generation of stars being born in a galaxy like the Milky Way. This gives unique insight into the birth of our own galaxy." Dr Swinbank added: "In this respect these stars are the seeds of future star formation in the Universe." Royal Astronomical Society President Professor Andy Fabian said: "It is exciting to see such a detailed picture of a very distant galaxy. "This pioneering work shows what our own galaxy might have looked like when it was a tenth of its present age."